I’m all dreams and hope here. I’m new cycling shoes strapped tight. I’m up early and I’m driving. I’m coconut water and two shot blocks in my jersey. I’m “Surreal and the Soul Providers” playing this song. I’m my fingers tapping on my steering wheel. I’m my mind happy. I’m at the lot of the race. I’m alone, and I’m smiling to the men who are here, no women yet, although there will be some. Give it time. Give it time. I’m out of my car and I see my teammate and she’s mad power packed into lean muscle. She’s bright and awake and drank a coffee. I forgot, thought you weren’t supposed to. She’s smiles and jokes. She’s confidence in eight a.m. light. Then another pulls up and she’s sun and humor, too. She’s cool calm. Her voice is strength. These teammates of mine: they’re kinetic victory. They’re winning just about to happen. My plan is to just jump on both their wheels and let this team trial unfold. My plan is to pull for a quick thirty and then I’m done. Thank you very much. Speed, speed, speed and pop back in. That’s my plan and it’s theirs, too, and we are one jersey. 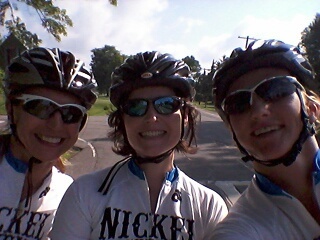 We are Nickel City Cycles in blue and white. And the race begins and it’s all talk of Teenage Mutant Ninja turtles and wacky inventions for peeing on the side of the road without a squat and the race director is counting us down and I’m in the middle and I see that line ahead of me and I know it’s going to be about the paceline because it’s always about the paceline. Ten seconds to start and it’s quiet. Thoughts turn inward. Align my foot halfway up the circle to get some leverage and the mind is quiet and the breath is just on the brink of getting scared but I’m hydrated and fed. I’m one day of rest and three before of work. I’m practice and practice and practice and now this is performance. And then it’s a go and we go and we are going and we are in a line and we are movement and we are spinning these wheels against the wind and we are fluid and we are calling to one another, “I’m on.” I’m on. I’m on. I’m on. The wind is against us but we’re changing gears, click it, find it, click it, find it. My teammates call to me, “You okay? You okay?” Yup. Feeling good. We move like it all makes sense. We move like this whole entire world makes sense. It is simple. It is take your turn, push hard and then fall off without falling off. Drop back and take your rest. Find that cadence. Find that wheel. Find that breath. And then we go up a slight incline and it gets me and the fear sets in. That dark dangerous fear finds me and says, “You can’t do this. You imposter.” The fear that reaches its claws on my neck and plants little ideas into my mind. You in fifth grade sprinting against the boy in gym class and the boy beats you because the boy always beats you. You losing. The split between your teeth and the thin little legs that couldn’t churn it out. Yoga. Yoga. Power in pose. Cool on a mat and I am strong. I can lift myself up. We make turns around the island and it’s all right. We’re doing it blind. Advice from the coach. Do it blind, ladies. Do it blind. I love technology. I don’t want to lose my gadgets. Gadgets make it easier. I don’t like this being blind, Coach. “Halfway there!” she calls and it’s good and bad because I thought we were farther, but we’re halfway. We are the middle. We are the paceline moving along the perimeter of this island. Then, a team passes us again (second one of the day) and it’s a bit devastating for me because I know my team is going slower for me. I know they could easily beat these other teams because it’s a time trial but they’re keeping with me. They’re sticking with me. I’m their third. It’s about the paceline. The paceline. And now thoughts of tea again. Thoughts of a café au lait. Thoughts of a book and a shady tree and my legs up. Destroy these thoughts. I’m in a race. And this is the struggle. My mind breaks. I know exactly when it happens. “I’m off!” I yell; I’m dropped. I’m in the back of the paceline and they are faster and I can’t keep up and my legs are burning and what would stopping feel like? It would feel good. The last third I am suspended by the kindness and diligence of my team. I am ten second pulls. I am at the back drifting farther and farther and my teammates fill in the gap and they pull for so long. Pull and pull and pull. Then my teammate calls “last mile” and I feel it take over. I feel the sprint. My legs want to move. I am in my drops and we are just speed. We are fast. We are moving so quickly because we’re working together and we’re sprinting and it’s heart achingly wonderful. It’s wind through the hair. It’s legs so fast. It’s form and function. And it’s crossing, together. My teammates are calling, “Shoulder to shoulder!” and we cross just like that. Three of us together and bow on our bikes and it’s just peaches and cream. It’s completion of something hard and I’m done and I can drink as much of this water as I want. And it was always about the paceline. We’re Nickel City in motion.